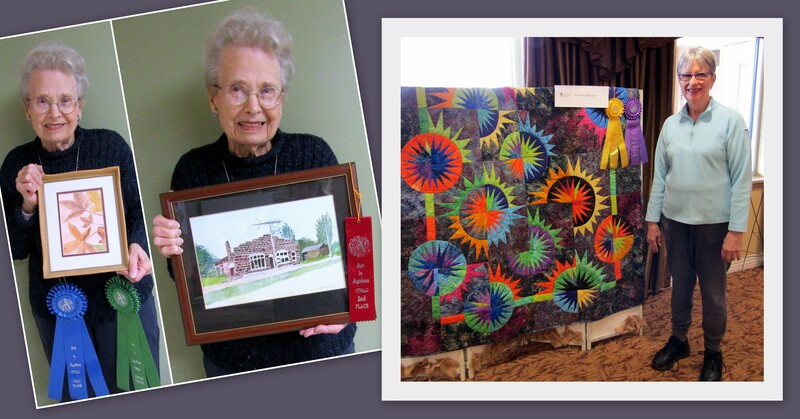 Frances learned to quilt from her mother 40 years ago. She creates all of her pieces by machine. Frances created Total Eclipse in 2018 and used the paper piecing technique. This technique is a slow process, but the result is very precise points and design. 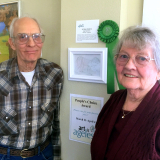 Frances is 77 years old and lives in Clay Center. She’s pictured above, on the right, with Total Eclipse. Arlene picked up leaves from the Utility Park walking trail. 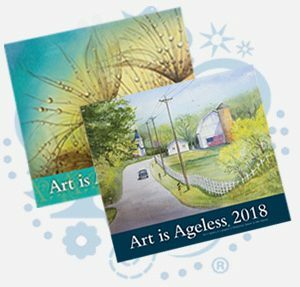 She drew several different kinds and painted them in watercolor. Arlene is 83 years old and lives Presbyterian Manor in Clay Center. She’s pictured above, on the left. 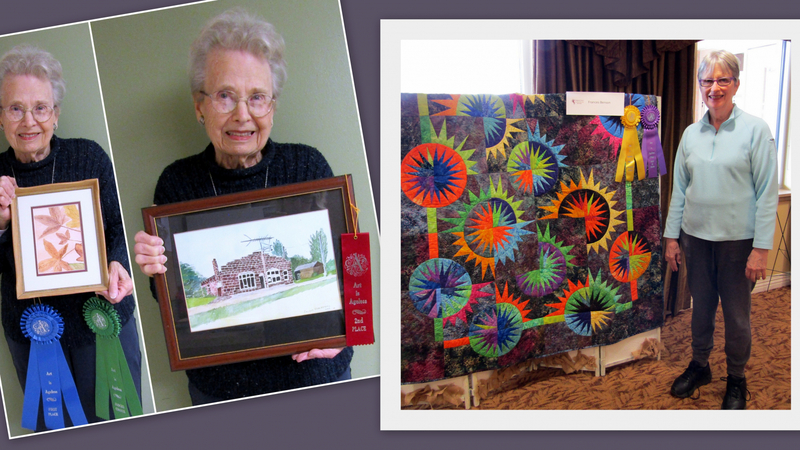 2nd– “Oak Hill Town Center” by Arlene Habluetzel (shown above). 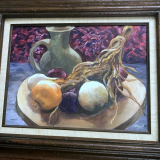 Arlene painted this watercolor during an art class from a photograph of her choosing. 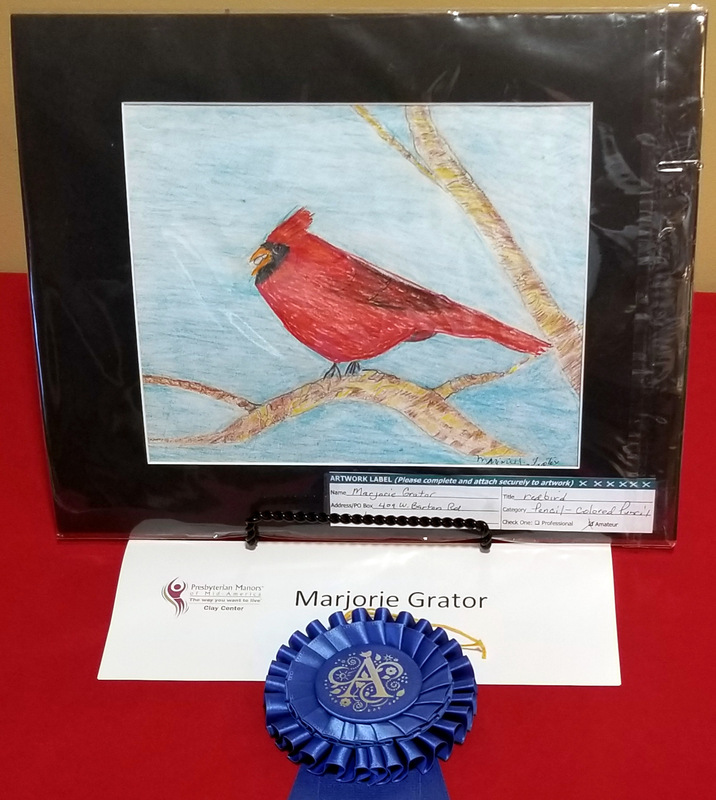 1st – “Red Bird” by Marjorie Grator. Marjorie created this work in 2019 with colored pencils. She enjoys sewing and crocheting as well as other artwork. 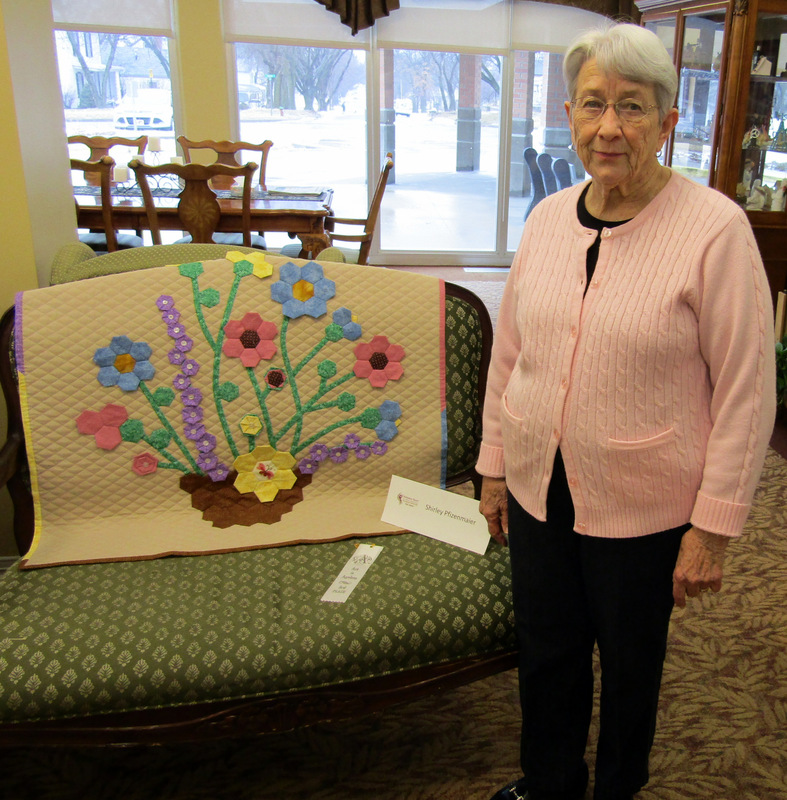 Marjorie is 96 years old and lives in Leonardville, Kan.
2nd – “Flowers and Fairies” by Lorraine Oman. Lorraine created this work in 2019 with colored pencils. She likes to draw, sew, cook, and bake. Lorraine is 87 years old and lives in Leonardville. 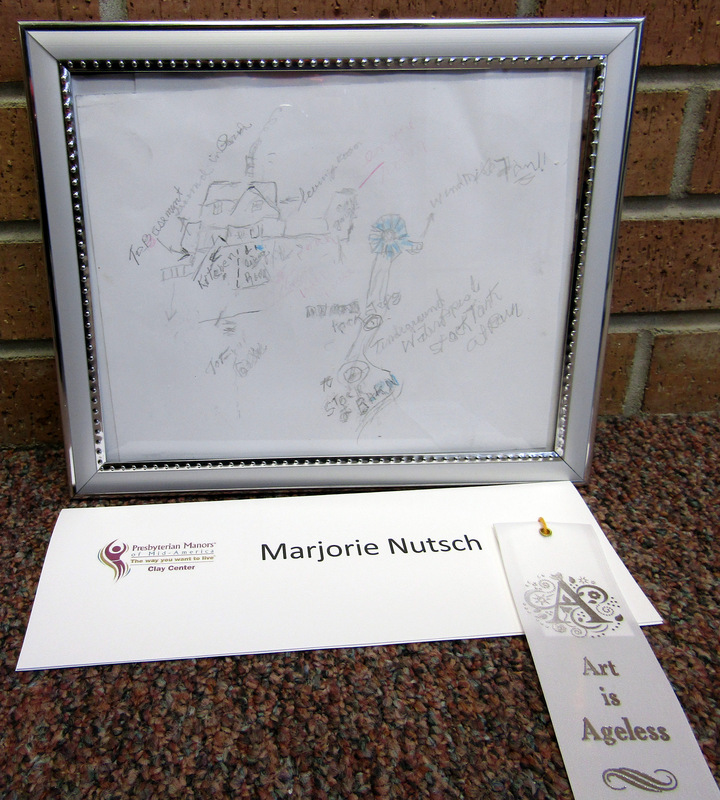 3rd – “Childhood Home” by Marjorie Nutsch. Marjorie drew her childhood home with pencil in 2019. She grew up in this home just north of Morrowville, Kan. She has many memories about that farmhouse. 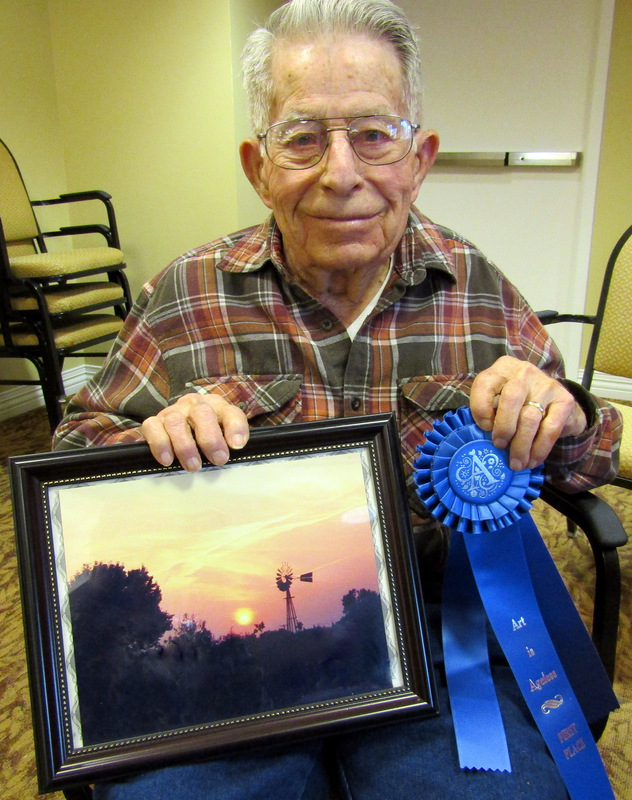 Marjorie is 97 years old and lives in Washington, Kan.
1st – “Sunset” by Fern Turner. Fern created this work in 2015 with his camera. He stood on the front porch of their home in Miltonvale, Kan. His front porch faced west. Fern is 94 years old and lives at Presbyterian Manor. 1st – “Bargello Study” by Frances Benson. Frances created this quilt in 2018. She continually likes to try new patterns and techniques. This quilt is a Bargello style quilt where strips of fabric are sewn together to form a tube. The tube is cut into various widths and sewn to make stair-step patterns. 2nd – “T-Shirt Quilt” by Verna Lee Musselman. 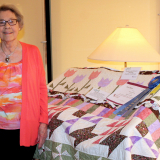 Verna Lee created this quilt in 2018 and 2019. 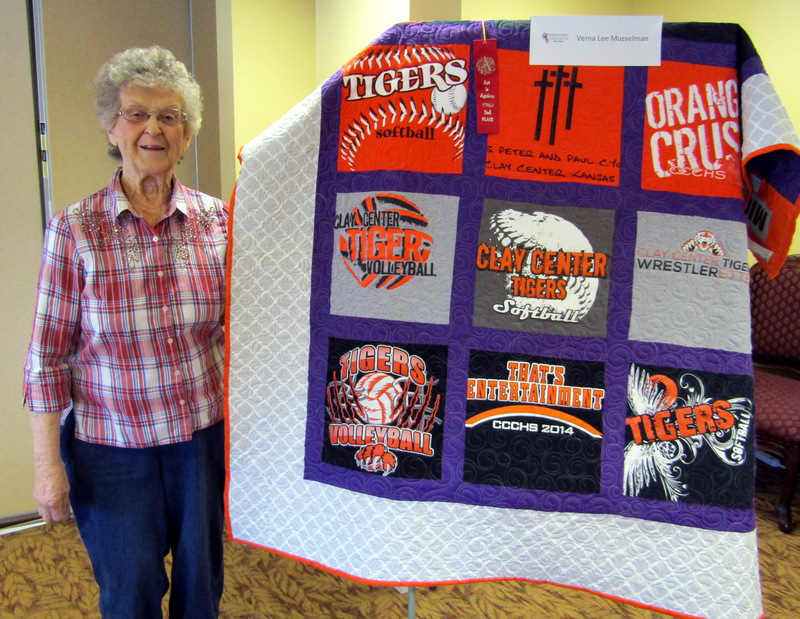 Her granddaughter gave Verna her t-shirts from high school events to make this t-shirt quilt. This is the third t-shirt quilt made for family. Verna arranged the t-shirts and a quilting machine stitched them together. Verna’s granddaughter is a sophomore at KSU and majors in Animal Science. Verna is 80 years old and lives in Clay Center. 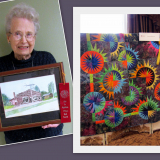 3rd – “Hexie Quilt Hanging” by Shirley Pfizenmaier. 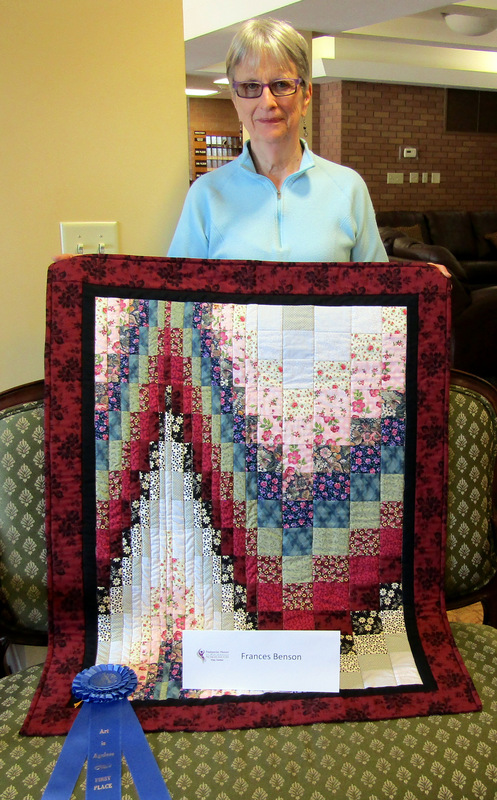 Shirley created this quilt in 2019. She found a Hexie Quilt book at a Fabric Store. It was new to her and took a lot of hard work to make a Hexie. It was applied on quilted fabric. Shirley is 86 and lives in Clay Center.